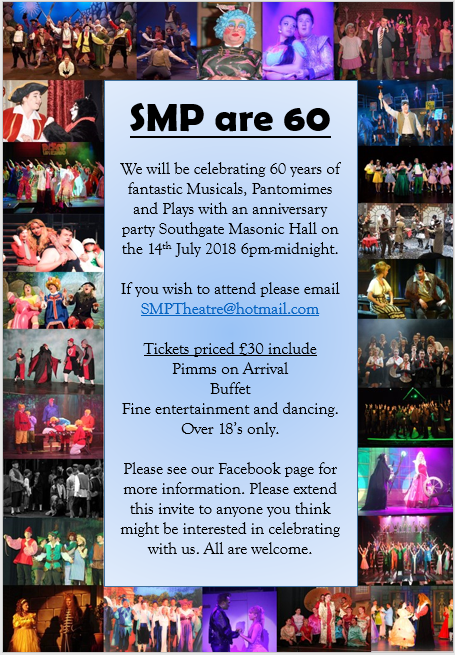 We will be celebrating 60 years of fantastic Musicals, Pantomimes and Plays with an anniversary party Southgate Masonic Hall on the 14th July 2018 6pm-midnight and tickets for the 60th Anniversary Party are on sale now. We have a fantastic evening planned for you with lots of catching up, a delicious buffet and time to reminisce on the past 60 years! – IN PERSON by cash or cheque (made out to Saint Monica’s Players) from Claire Suzanne or Debbie Wall. – ONLINE by sending a bank transfer to our account. Your tickets can be mailed to you. Please extend this invite to anyone you think might be interested in celebrating with us. All are welcome.